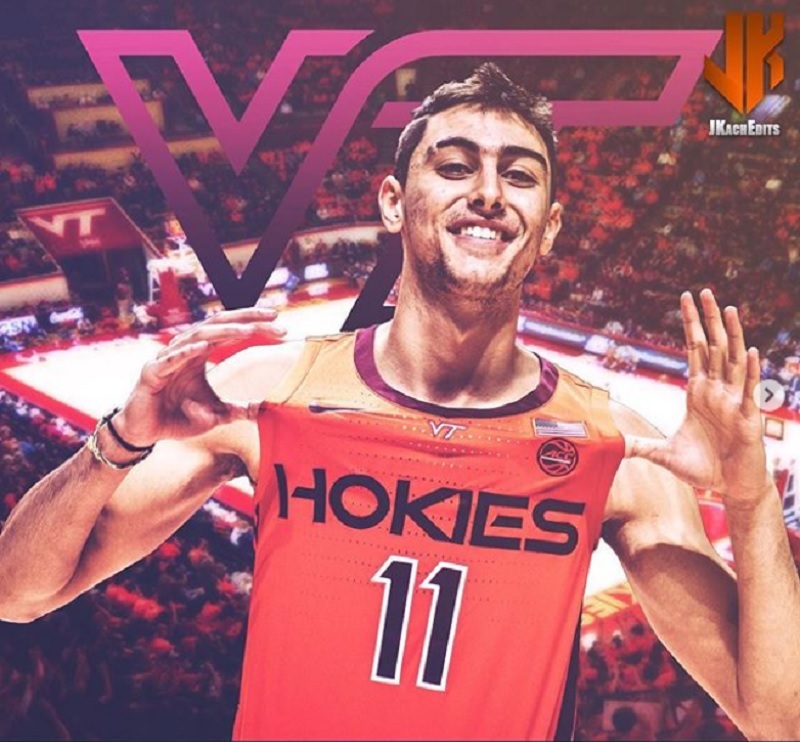 Virginia Tech 2019 men’s basketball signee Yavuz Gultekin has been released from his letter of intent, per his Instagram account. Gultekin is a 6-7 forward originally from Turkey who played for Bishop Walsh School in Maryland. He is the second 2019 Tech signee to be released from his LOI, joining 4-star guard Anthony Harris. There is still a possibility that both players could end up at Virginia Tech, though at this point Harris seems more likely. Assuming neither player signs with the Hokies, here is what Virginia Tech’s current 2019-20 roster looks like, including the two players who have entered their names into the transfer portal. Bede and Nolley could return to Virginia Tech, though Bede seems more likely to return than Nolley at this stage. Buzz leaves after a sweet 16 appearance. I understand he wants to go home, but if he takes any recruits from a depleted roster I lose all respect for him. Not right. Remember Buzz brought Hill and others with him from Marquette to tech. That is the way it works. Kids are picking a coach first and school second most times. Events like this are much more a reflection on the outgoing coach/staff, and the recruit, than they are on the incoming coach. Let’s face it, during the recruiting process a significant level of bonding needs to occur between the recruit and one or more members of the coaching staff. If the staff bails, the recruit can’t help but feel that a large part of what he or she committed to no longer exists. Of course if we had hired Tom Izzo or equivalent, it’s more likely that the previous commits would stick. But let’s remain realistic. Coach Young certainly needs to establish communication with our existing players and our previously committed recruits. We all know that Brent created a cult of personality, and these kind of events are likely to happen in that type of environment. Thanks buzz. We hardly knew ya. I hope that down the road a future VT squad gets a chance to take him down a notch or three. We got to know Buzz very well. Is the first ‘test’ of coach MY recruiting skills to keeping players already committed? 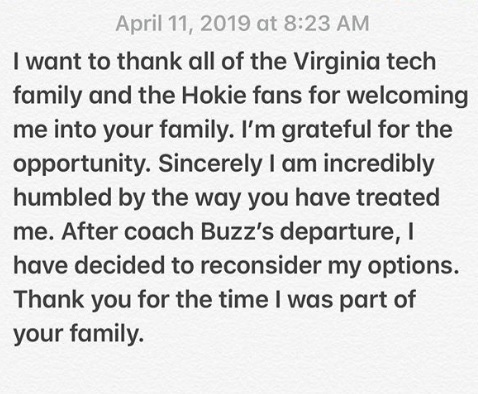 Or is this unfair considering a typical Buzz recruit is more committed to Buzz than to the HOKIES? Are these guys hoping to follow Buzz? I wouldn’t judge his recruiting skills on it. I think I’d be surprised if recruits did not open up their recruitment at this stage. I don’t see these as rejections of Mike Young necessarily. Just that we gave them an opportunity to feel really sure about things, and taking it might be prudent. Really goes to show how central the coach is to recruiting relationships and that many kids are either less loyal to an actual school or completely focused on their playing career vs other aspects. Did he ever set foot on campus, other than an official visit? Put these departures on BW. 100%. “Thank you for the time I was part of your family.” That’s kind of like accepting a job after an interview and a better job comes up when you get back home that same day.” The way “Family” is thrown around these days is concerning. For me, family is unconditional love and total commitment. Any way, best of luck to the young man going forward. Let’s see, the family he would be coming to now would be entirely different than the family he thought he was getting. If I accepted a job to a company after interviewing with what I thought would be my boss and all of the supervisors that I would be working with, then they all QUIT, I would have some serious second thoughts about that job. “QUIT”? The coaches and players that have left did so for MUCH greener pastures, which is their right. Also the way sports work these days. But you make it sound like they all just left due to issues/problems at their current jobs. Yeah, it’s just a trope, it is kinda mindless maybe even a little scalp taking when he hasn’t been anything here. This is not good at this point. Hoping our new coach could save at least one player. At this rate we won’t have enough players to field a team. Curious as to whether some of Young’s players at Wofford would migrate to Tech? Would they be top 200 players when recruited? NO; but they would know his system; and if he can beat Seton Hall with his guys, maybe he can coach up others to beat uva.